Often times with central vacuum systems it is the part that gets the most use and abuse that needs to be replaced. For this reason we carry a full line of replacement power heads for most brands. Rather than spend a large sum on a brand new Attachment Set, we want to save you money by just replacing the parts needed. If you have any trouble finding your power head model, feel free to contact us at the toll free number listed above. The central vacuum power head is located at the end of the hose and is used to groom the carpet. It is usually powered by an electric motor, but sometimes can be powered by the suction of the unit itself. The electric motor turns a reinforced geared or flat rubber belt, which in turns drives the brush roll for the unit. It is recommended that you replace any power head with an electric one. 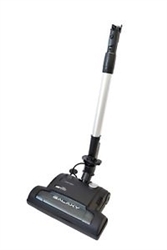 They are more powerful and can agitate the carpet for deep cleaning. This is in contrast to an air powered one which tends to only surface clean. Generally central vacuum power heads are low maintenance and do not require a lot of work done on them. Once a year you should service your model by removing the brush roll and clear it of debris such as string and pet hair. This will prolong the life of the brush roll and prevent the debris from entering the bearings. You should also routinely change the belt of your power head every 6 months. This will maintain the tension on the belt to make sure it is properly turning your brush roll. There is also a wide range of quality within the different central vacuum power heads. Companies such as beam and lindhaus manufacture a very high quality power head known to last. Other companies try to keep down the price, and therefore have a less superior product. When considering which power head you need for your own home, you should take quality, durability, and price into consideration. After weighing out the pro’s and con’s you can then find the correct replacement.